Yazhou is located in a back street behind Middle Haixiu Road, on the other side of the road to Jin Niu Ling Yuan. It was badly damaged by fire in 2005 and has been in a state of disrepair since. 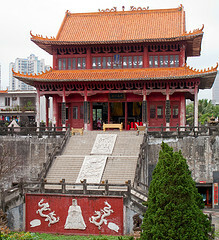 The temple at the top of the stairs at the far side is intact and still being used. The rest of the structure has been taken over by a number of very untidy business enterprises.